Gordon was learning about maps in his kindergarten class. His teacher read a beginning book about maps to the class, As the Crow Flies: A First Book of Maps (Hartman, 1993), and asked students to paint a map of anything they wanted. The image below is Gordon's map of the world. Piaget's stage theory can provide a teacher with a general framework in thinking about developmentally appropriate practices for different ages and grades, and students probably move through these stages in the same order, if not all at the same age. Research on learning and teaching geography has further explored this relationship between the development of thinking and map reading skills (Forsythe, 1995; Gregg & Leinhardt, 1994; Stoltman, 1991). Findings show that children are able to understand map symbols and that they represent places and things on a map, but it is more difficult for them to read and interpret more abstract symbols and to understand the relationships between the symbols. Scale, measurement, and the frame of reference for maps can also be difficult for children. Instruction in map skills should therefore be clear, structured, and developmentally appropriate. It's important to note in addition that Trifonoff's (1997) research revealed that even young children demonstrate the ability to use advanced mapping skills with appropriate instruction. To address the difficulty that research shows students may have with more abstract map symbols and the relationship among these symbols on a map, introduce map skills with literature that contextualizes mapping in a narrative, can be related to where in the world each student lives, and engages students by "doing geography." Recommended best practices today reflect this constructivist approach to teaching geography, particularly the value of hands-on, active learning and inquiry approaches, such as activities and projects (Bednarz, 2003 ). For example, relating new concepts to locations in the students' world and using visualizations, demonstrations, and student-created models, charts, and graphs enhanced student learning (Hickey & Bein, 1996); map-makers learned more than map-readers (Gregg, 1999), and students making maps in groups had a better understanding of map concepts than those who worked individually (Leinhardt, Stainton, & Merriman Bausmith, 1998). Choose and read a book appropriate for the grade level that introduces key concepts and terms in either a narrative book of fiction or an engaging informational book. After reading and discussing the book, and encouraging students to relate the terms and concepts to their own experience through reader response questions and prompts, students can learn to both read and make maps that show the spatial relationships among people, places, and environments. They can use primary data to make their own maps and secondary data in the form of maps they read. Primary data: Students can collect the primary data necessary to create their own maps in the classroom and school, or in the community on a field trip. They can count and measure spaces in their own environment, such as the school, or take photographs with digital cameras on a field trip, such as one to city hall. They can also keep records of observations in both types of places. These data can be used to construct their own maps. Secondary data: Students can use maps as a secondary source of information. A good way to begin is to link their experiences to the map. Other secondary sources are online databases and books, such as an atlas. In these sources, they can read maps, charts, tables, and graphs with geographic information. To provide developmentally appropriate instruction in map skills, begin with the locations most familiar to students in Grades K through 2 — such as their own rooms or houses or the classroom, school, or community. Instruction in Grades 3 through 5 can be expanded to cities, states, the United States, and the world; in Grades 6 through 8, a historical view can be added through the use of maps of the ancient world and other historical periods. Even the youngest students can go online to Mapquest and request a map for any location, such as their home, school, or community. Digital cameras can be used to photograph sites in the school and community to help students create maps and use symbols to represent the sites on maps. The U.S. Geological Survey (USGS) website includes numerous map collections that students can search. Maps.com and Maps101.com offer access to thousands of maps, mapping software, and ideas for teaching activities and lesson plans. Geographic Information System (GIS) merge various layers of information in a computer environment that allows for retrieval, storage, manipulation, analysis, and visualization of geographic information. Research on GIS use in elementary schools has shown that it can help students practice geographic skills, that it is extremely motivating, and that it enhances student learning (Keipet; 1999). The popular PBS television game show for children Where in the World Is Carmen Sandiego? built knowledge of geography, taking children around the world as they searched for the elusive Carmen. Carmen Sandiego began as a detective in a computer software game by Broderbund Software, and animated adventures on DVD and other products are available worldwide. The game can be projected from the computer onto a screen or large monitor. Students observe and take notes, and they acquire knowledge of geography and maps as Carmen travels worldwide. Read aloud Mapping Penny's World by Laureen Leedy (1998). 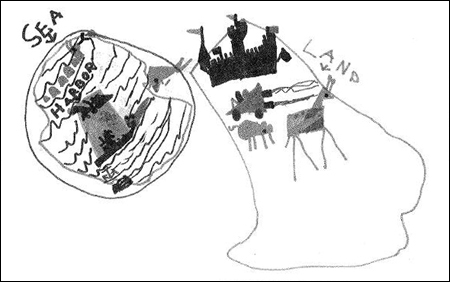 In the book, a young girl makes a map of her room for a school assignment. She then becomes inspired to map all the places that her dog Penny loves. While the book is in a narrative form, it also provides good explanations of map vocabulary, such as compass rose, scale, lzey, and symbols. 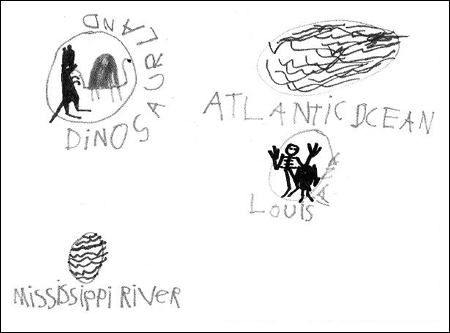 It provides examples of the kinds of maps that young children can read, understand, and make themselves. Ask students reader response questions and prompts: What part was the most interesting to you? What map would you like to make? Students can first make a map of their own room, drafting it from memory and then revising it at home. Then make a map of the classroom with students by first measuring it and then creating an appropriate scale to make a map. For example, one foot in the classroom could equal one inch on the map. For the youngest students, model making a map to scale with the measurements on a piece of chart paper or butcher paper. A more advanced project would be for each student to use graph paper or simply measure one inch to one foot for the scale of the map. Students can add a compass rose, scale, key, and symbols to their maps. The book People, by Peter Spier (1980), while not a book specifically about maps, takes a global view of the world and all the people in it. It is a wonderful read aloud that tells how people all over the world are alike and different, but that each one of us is unique in our own way. After using reader response questions and prompts to talk about the book, such as "What is unique about you?" and writing about their unique qualities, students can build on this experience to learn map skills. Students can collect data that identify their own birthplace or the birthplaces of their parents, grandparents, and other family members. Use the following tree map template to help them collect this data. On a large map of the world in the classroom, students can use sticky notes or stick pins of one color with labels attached to show where they were born. The birthplaces of parents can be shown with another color, and grandparents, if known, using another color. In most classrooms in the United States, the plotting of these birthplaces would cover many parts of the world. Each student could also connect their birthplace and that of their parents and grandparents to show the relationship among the locations for each one of them. Tapping into the background and prior knowledge of English learners is a first step in meaningful instruction for students whose home language is other than English. This is accomplished when students do research and create maps of their own homes, schools, communities, and places of family origin. Other important strategies for ELLs include using visuals such as maps and models such as a globe, which are also used in learning about maps. Primary language support can be used with books in the home languages of ELLs. For example, the book People (Spier, 1987) is available in Spanish. Map frames with labels can be used for students creating their own maps. For the classroom, provide a black line outline for the room measurements to scale. Add labels for Compass Rose, Key, and Scale, with space for the student to fill them in after the information has been modeled for each one. Together, create a list of symbols that the students can then copy and place on their maps. The maps students create will demonstrate their understanding of mapping skills. Checklists for different types of maps and grades can also be used not only to assess whether students have used map making tools correctly, but also to guide them in doing it. They can use these checklists as a to-do and self-editing list. They can also work in pairs and assess and edit each other's maps, revising and improving as necessary. They can also include written comments explaining how they created each item and how each one is used.